I don’t know about you guys, but these days I don’t have the opportunity to make as many new friends as I did when I was younger. The older I get, the harder it is to really connect with people. Maybe it’s because I’m a crotchety old lady, or maybe it’s because life is so much more complicated than, “hey, come over after school and play.” Still, every once in a while someone comes along who I fall in friend-love with. Full disclosure: if I like you, I tend to latch on with a fierceness that I’m afraid can be a little bit alarming. 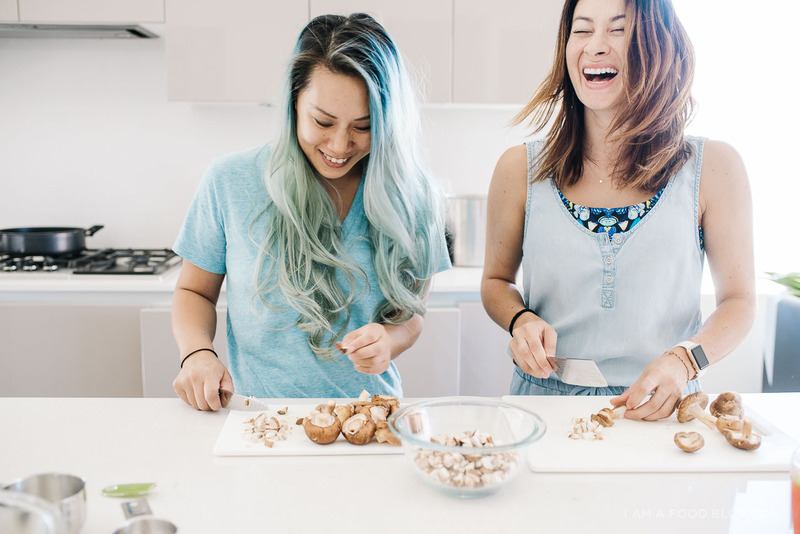 As scary as I am, I must be doing something right because the effervescent Alana, from Fix Feast Flair is not just an online friend, but a real life one too. I suspect if we lived closer together, we might not-so-sneakily find a way to be neighbors. As it is, normally we’re about a thousand miles apart. But, a couple of weeks ago, the stars aligned and Alana, with her man Moses and puppy Vienna in tow, showed up on my doorstep for a weekend of salad rolls, microwave nachos, hot tub hangs, not-so-poker-faced poker games, thrift store shopping, and all around good old fashioned fun. We absolutely knew that we wanted to cook together so we chatted for a long time about what we would make. We flirted with a Hawaiian-style McDonald’s breakfast, anything with Spam, and a million other things before settling on dim sum. 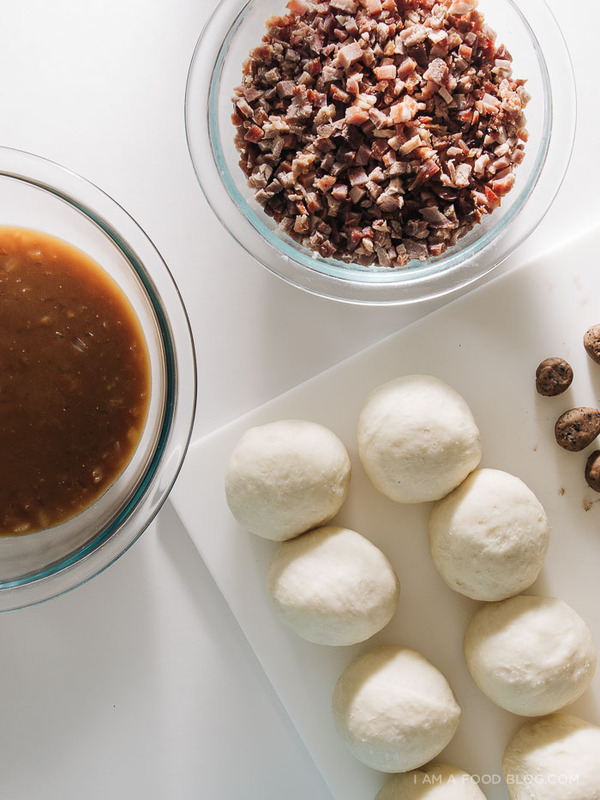 Initially we wanted to make a dim sum party, but we only ended up making steamed barbecue pork buns and sticky rice. Which, didn’t turn out to be a bad thing because they’re two of my favorite things to order at dim sum. 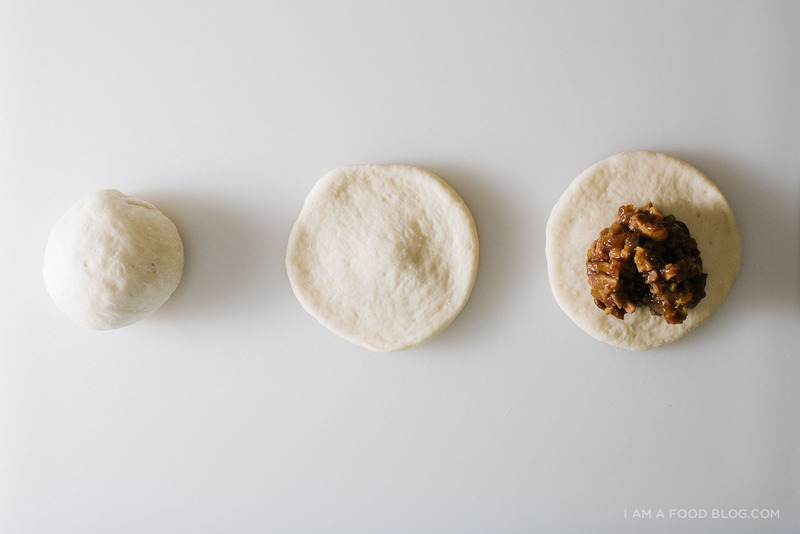 Steamed barbecue pork buns, or cha siu bao, are addictive. If you’ve ever had them at dim sum, you know what I’m talking about: the little bamboo steamers that usually come with three bright white fluffy, slightly sweet, steamed buns filled with savory chunks of saucy cha siu hidden inside. They’re an irresistible combination of carbs and protein and they’re hand held; what more could you want? I don’t know about you, but food with faces is kind of a thing around here. So barbecue pork buns with panda faces? Too cute to even think about! Alana and I were basically giggling with glee the entire time we were making these. Luckily Mike and Moses were out by the pool because there was a lot of squee-ing going on. Recipe-wise we cobbled these together from a couple of different ones floating on the internet. We weren’t ambitious enough to make our own cha siu, but the truth is, store bought cha siu is a delight in it’s own right. The little panda faces were made with black sesame mixed into the bun dough, but we found that punching out seaweed faces was a lot faster and quite a bit cuter as well. These guys were cute, fluffy (a bit too fluffy due to over-proofing – some of them had demented heads), and filled with cha siu goodness. 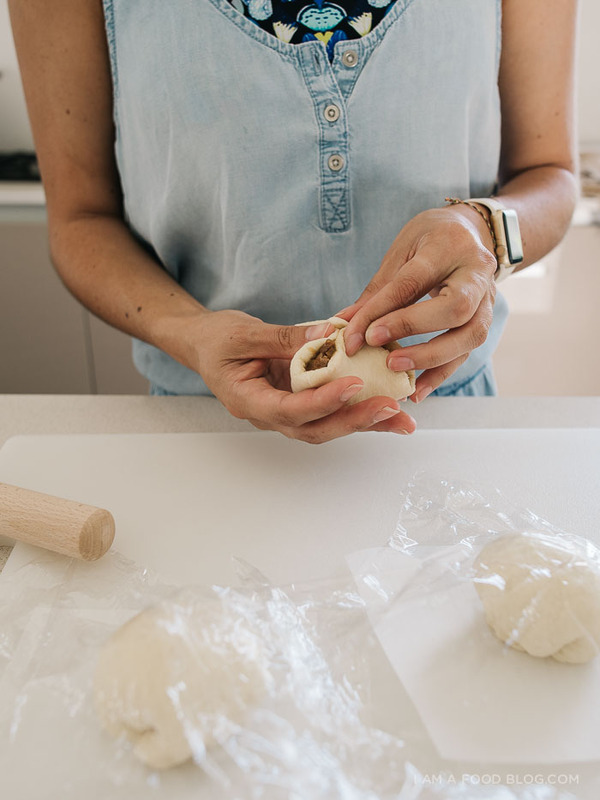 There’s something about cooking with someone that makes it all the more rewarding when you’re done, even if you’re too busy having fun to notice that your dough has over-proofed. I had the best time hanging out with Alana (and Moses!) in real life. Both the buns and the sticky rice were absolutely delicious. But I think my favorite part of the day wasn’t even cooking together; it was just hanging out and chatting. For Alana’s half of this joint post, hop on over to Fix Feast Flair for a little sticky rice action! 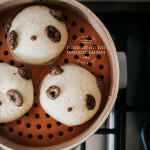 PS – I wanted to call this post “Dim Sum Panda Barbecue Pork Buns” because they’re shaped like pandas. But then I started thinking, what if people think they’re filled with panda meat?! In the bowl of your stand mixer, stir together the warm water with the sugar. Sprinkle on the yeast and let proof for 10 minutes. There should be tiny bubbles on the surface. Add the heavy cream and flour and knead on medium speed until smooth and elastic, about 5-6 minutes. Alternatively, knead with your hands. The dough will start out quite dry, but continue to knead until all the ingredients are incorporated. The dough should be stiff but not sticky. If sticking to the sides of the bowl, add an extra tablespoon of flour. If it doesn’t come together as a dough, add an extra teaspoon of cream. Cover the bowl with plastic wrap and cover with a kitchen towel. Let proof until doubled in size, about 1 and half to 2 hours, depending on room temperature. Cut out 9-10 parchment paper squares and set aside. While the dough is proofing, make your filling. Heat the oil in a wok or frying pan over medium high heat. Add the shallots and cook until softened, but not browned. Turn the heat to medium low and add the oyster sauce, sugar, sesame oil, and soy sauces. sugar, soy oyster sauce, sesame oil. Stir together until sugar dissolves and mix comes to a simmer. Add the chicken stock and stir in the flour, whisking until slightly thick. Remove from the heat and fold in the barbecue pork. Chill until completely cool, covering as necessary. Once the dough is doubled, place the dough on the countertop. There shouldn’t be a need to flour your countertop; the dough shouldn’t be sticky. Punch the dough down. Divide into ten equal parts. Working with 1 portion at a time, gather 4 corners to center to create 4 folds. Turn seam side down and mold gently into a ball. Note: If making panda faces with black sesame features. Take one portion and knead the black sesame into the dough until evenly distributed. Let dough rest, covered lightly with plastic wrap, while shaping. Using a rolling pin, roll out the balls into 4 1/4 inch shaped disks. The edges should be slightly thinner than the centre. Scoop in 1 to 1 1/2 tablespoons of the cooled filling and pleat and pinch to close. Place finished buns on the prepared parchment paper squares, seam side down. 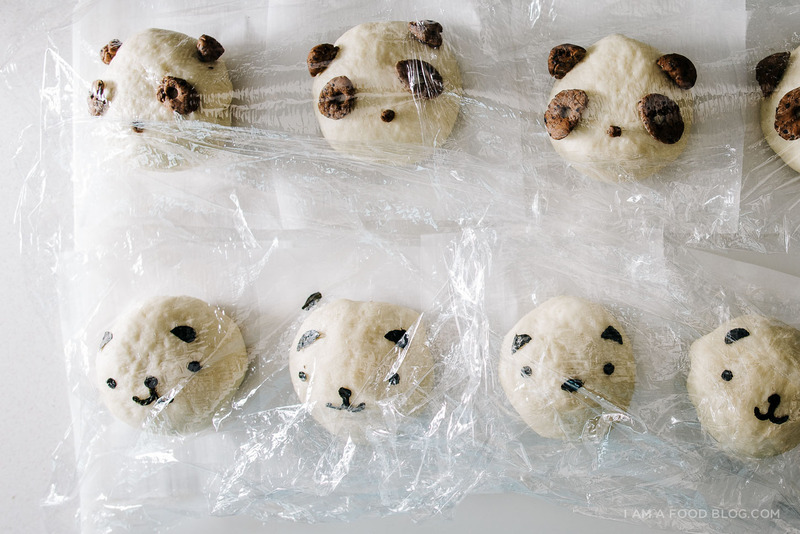 For panda faces: cut off pieces from the black sesame dough and roll into small balls accordingly for each face. You’ll need 4 larges pieces (eyes and ears) and one tiny piece (nose) for each panda. For the ears: gently push 2 of the balls into the top of the face (using a bit of water to help with sticking if necessary). For the eyes: flatten 2 of the balls and use a clean straw to cut out eye holes. Place on the panda face, along with the nose. If using seaweed, use a seaweed punch, or cut out shapes with scissors. 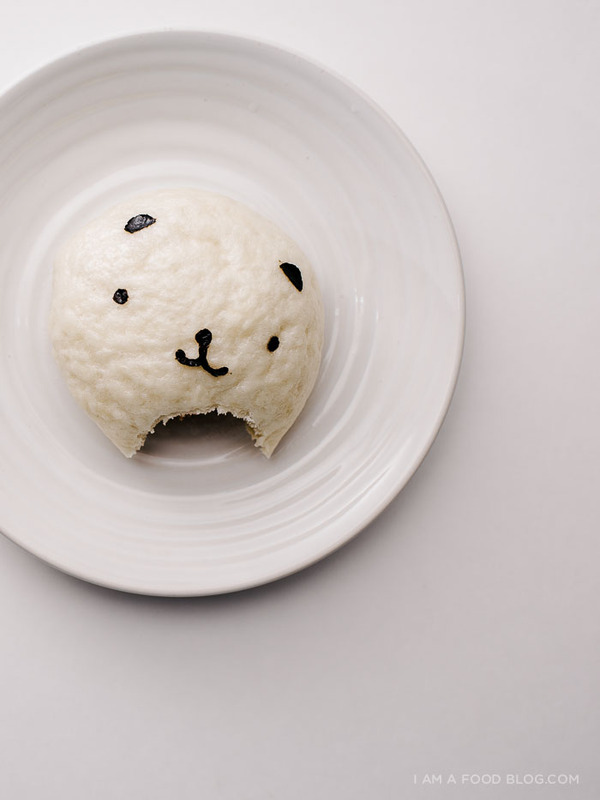 Use water to apply seaweed shapes to buns. 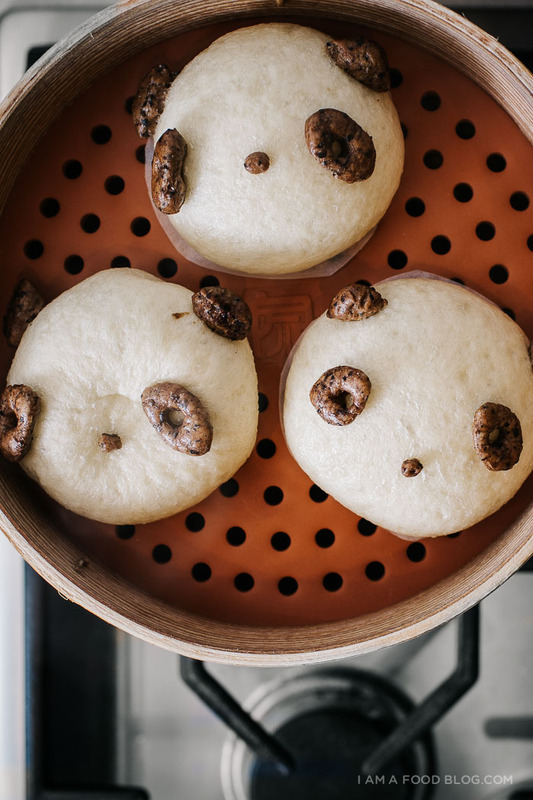 Arrange the completed buns in a steamer with 1 1/2 inches of space in between. Cover the steamer with plastic wrap and let proof for 1 hour. The buns will be puffy but not quite doubled. 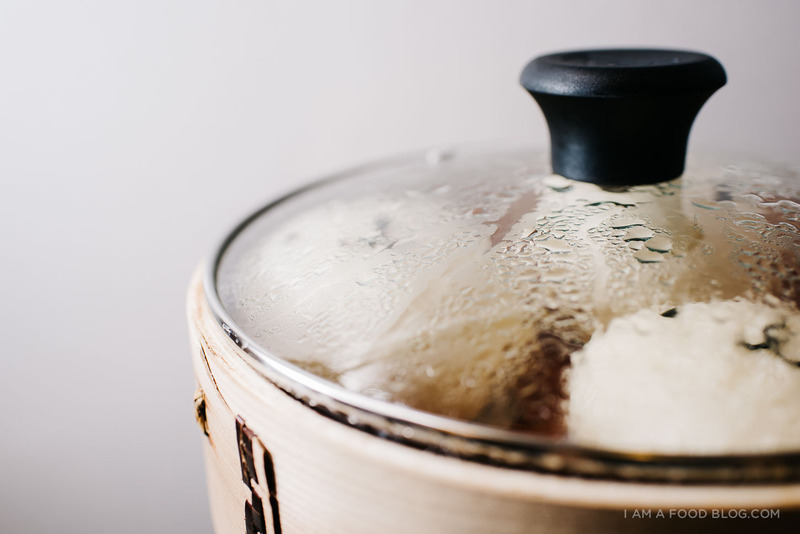 Steam the buns: add water to a pot or wok and bring to a boil. Turn down to medium and place the steamer (with the lid on) on top. Steam on medium for 10 minutes. Open the lid at 3 minutes to let some steam out – you don’t want the temperature to get too high as this leads to inflating and deflating buns. 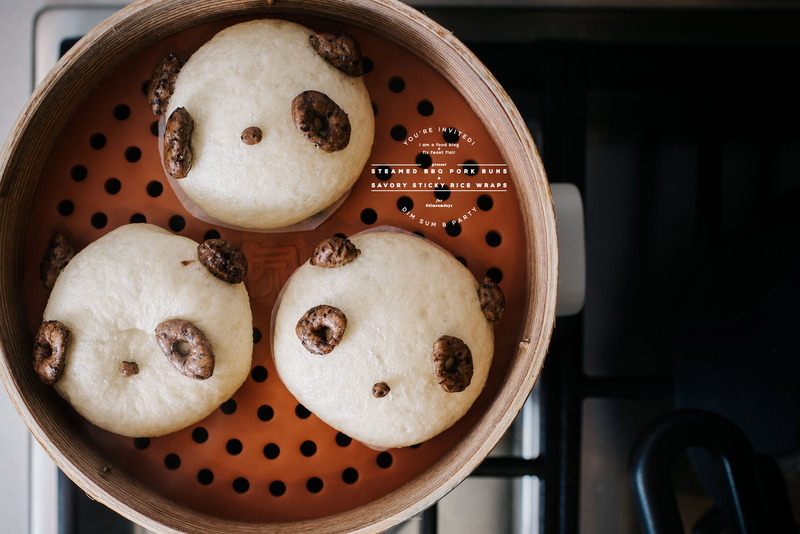 Once steamed, the buns should be puffy. Remove from the steamer, let cool slightly and enjoy warm! Note: Asian bread flour or Hong Kong bread flour can be found at most Asian grocery stores. Asian bread flour makes your buns more white and fluffy – it’s very very white with a slightly lower gluten content. 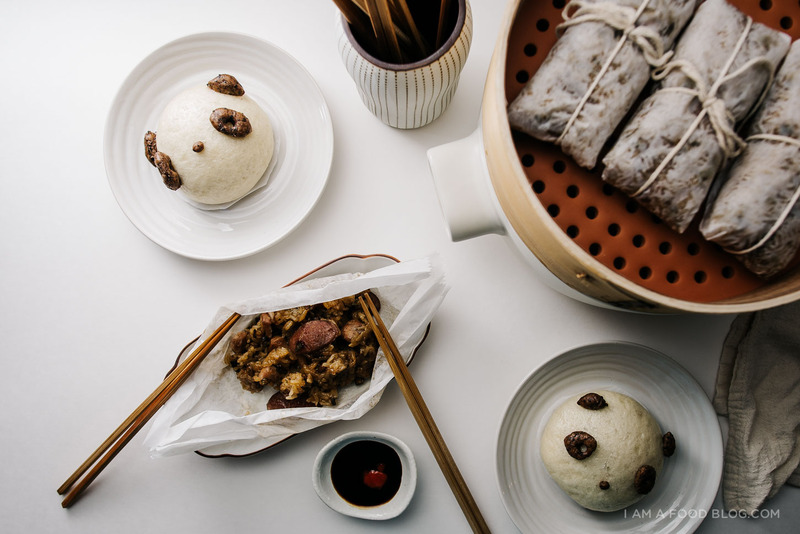 I haven’t tried this recipe with all purpose so I’m not sure what the result would be but many bbq pork bun recipes online use all purpose flour, so I expect that you would get a similar result. I LOVE THIS (+ YOU TWO) SO MUCH. Aww! It’s so sweet how you describe your friendship. Alana’s sooo her badass, awesome self in her blog too, I think she makes us all think we’re BFFs!! It’s so great that you two get along in real life because we get to eat cute pork buns that look like pandas! Where would you get panda meat anyway? Lol. These are awesome. Cheers to you both. Can’t wait for more collaborations. The number of friends I have has stayed 5… No, 4… No, 3… since highschool… So it’s ok. We’re all weird. You guys are the absolute cutest. And, truth be told, even if they were filled with panda meat, I’d probably still squee with excitement because you ladies can do no wrong in my opinion, and maybe panda is the new pork. (Panda should definitely not be the new pork, but you know what I mean…) <3 <3 <3!!!! Pix of you and Alana are the cutest. Love this little collab! so cute! (the buns and you guys). 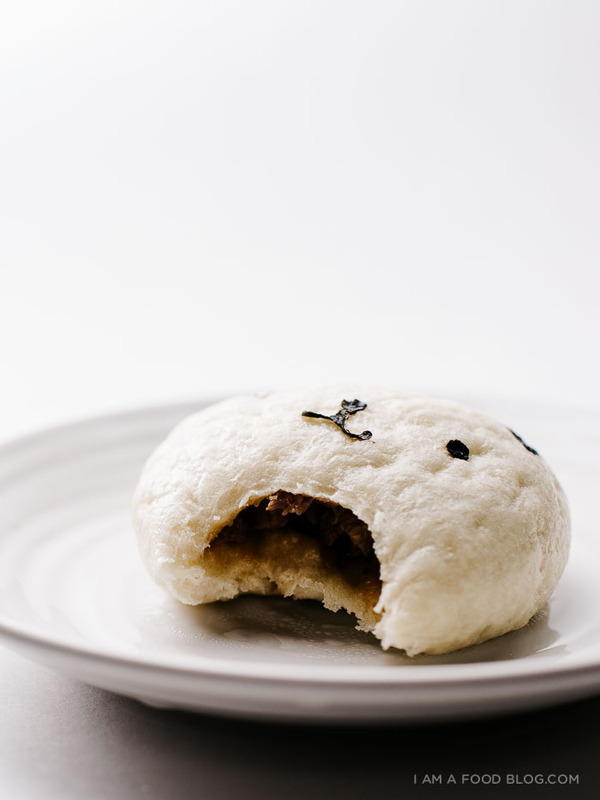 but also- char siu baos! whenever i go out for yum cha with my family, we always get a couple of plates of them; it’s one of the few things my brother will eat, aside from the rice noodles with meat inside and beef chow fun. and i don’t blame him- they’re so tasty! These look so delicious! I’ve never made pork buns before! I love Dim Sum! We have to cook gluten free in our home. Do you think it would be possible to replace Asian Bread Flour with an gluten free alternative? ooh i haven’t tried – i don’t think the texture of gluten free would hold up very well…but there are a lot of gluten free dim sum items like rice rolls and such! Wow! It really makes me hungry. Thank you for giving a stunning recipe for us. I would try to do it at home! Moreover, your panda buns are soooo cute. These panda dim baos are so adorable!